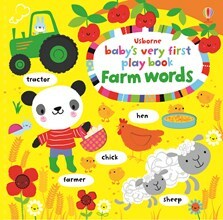 This charming word book is full of bright pictures, winding fingertrails and friendly farm animals to meet. Babies and toddlers can explore a hen house, see the farmer in his tractor, visit a field full of cows and sheep, and lots more. With farm words and sounds to say on every page, from cow, calf and moo to flower and toadstool. A joy to share. Our Baby's Very First Books series was crowned winner of the Best Preschool Publishing Range category in the first ever Progressive Preschool Awards. A judging panel comprised of buyers from top names such as Harrods, Mothercare, Boots, Toys R Us, Selfridges, Sainsbury’s, JoJoMamanBebe and Waitrose selected the winners in each of the award's four categories.